Employers with 1 to 99 employees have been driving the trend to adopt prescription drug plans with four or more tiers. In three years, plans with four or more tiers increased approximately 60% among these groups, making this the top cost-containment strategy for small employers, who make up the backbone of America. Even the largest employers (1,000+ employees), 81% of which historically have offered plans with two or three tiers, have seen a 12.9% decrease in these plans as they, too, migrate to plans with four or more tiers (albeit more slowly). The construction, mining and retail industries have also been steadily leading the migration to plans with four or more tiers over the last three years, and in the latest UBA survey, 47.5%, 53.2% and 46.3% of their respective plans fall in this category. But this year, the utilities industry has made a more sudden switch, with 58.3% of those plans now consisting of four or more tiers, leapfrogging its perennial tier-climbing peers. This is a significant jump, considering nearly 20% of plans in the utilities industry were still two-tier plans just three years ago—far more two-tier plans than any other industry group at that time. However, this wasn’t a total surprise since, in the 2014 survey year, the industry had an above-average amount of three-tier plans (65.9% vs. an average of 57.1%). The education and manufacturing industries are more reluctant to shift to plans with four or more tiers. Over the last three years those industries have maintained the highest amounts of three-tier plans, and in the latest survey, 52.8% of their plans remain at three tiers. Two-tier plans are becoming nearly as rare as single-tier plans, shrinking 45% to 4.3% of all prescription plans in three years. Agriculture has the most holdouts, with 14.8% of plans still comprised of one or two tiers. Regionally, the East Central U.S. has been leading the migration to plans with four or more tiers for the last three years, followed by North Central and Southeast employers. In the 2015 survey year, Southeast employers eclipsed East Central employers with 60.7% of their plans with four or more tiers. Strangely enough, East Central and Southeast employers have the lowest percentage of three-tier plans (34.3% and 34.1%, respectively) but the highest percentage of single-tier plans (4.7% and 4.2%, respectively). Other Western employers (excluding California) also have below-average three-tier plans (40.6%), above-average four-tier plans (49.1%) and above-average (10.2%) one- to two-tier plans. California employers have the most two-tier plans (22.9% vs. the average of 4.3%) which, although still off the charts, represents a 20% decline from the previous survey year. Mid-Atlantic and New England employers have had the most three-tier plans for the last three years, making them the top resisters of plans with four or more tiers over time. For more information on prescription drug trends, including the companies making an early leap to five-tier plans, download UBA’s free (no form!) 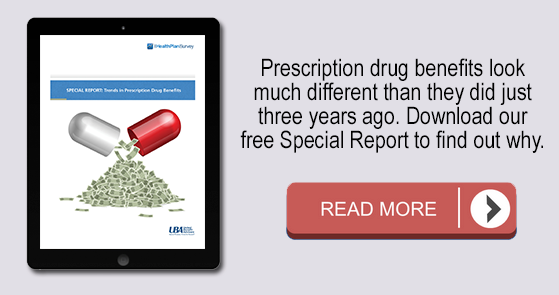 publication: Special Report: Trends in Prescription Drug Benefits.